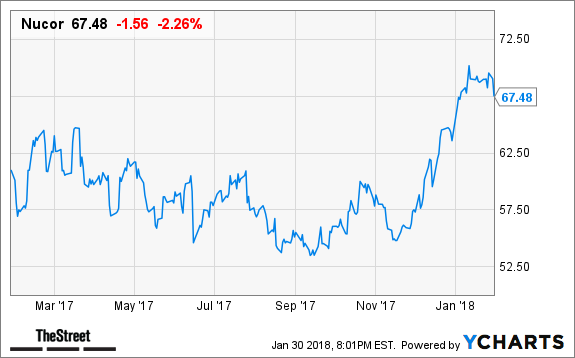 In an "Executive Decision" segment, Cramer spoke with John Ferriola, chairman, president and CEO of Nucor (NUE - Get Report) , the Action Alerts PLUS holding that just posted a 10-cents-a-share earnings beat on a 29% rise in revenues. Shares of Nucor declined 3.2% after the report. Ferriola said that Nucor's earnings are the highest they've seen since 2008, and their end markets, like autos and energy, continue to be strong. Additionally, the outlook for those end markets is the most optimistic they've seen since 2004. Ferriola was also upbeat for 2018, saying that they look forward to tax reforms, actions on trade and, hopefully, an infrastructure plan that can help support our booming domestic economy. On the topic of trade, Ferriola reiterated that the U.S. cannot have strong national defense without a robust steel industry. Finally, when asked about their capital allocation plans, Ferriola explained that they've invested over $8 billion over the past nine years, but have always maintained a balanced allocation plan that includes returning capital to shareholders. Cramer and the AAP team are telling their investment club members about Nucor's earnings beat and the outlook for 2018. Get in on the conversation with a free trial subscription to Action Alerts PLUS. Over on Real Money, Cramer explains why he like the Keurig (GMCR - Dr. Pepper (DPS merger. Get more of his insights with a free trial subscription to Real Money.